Essentials.TF Monthlies have arrived at the month of May! 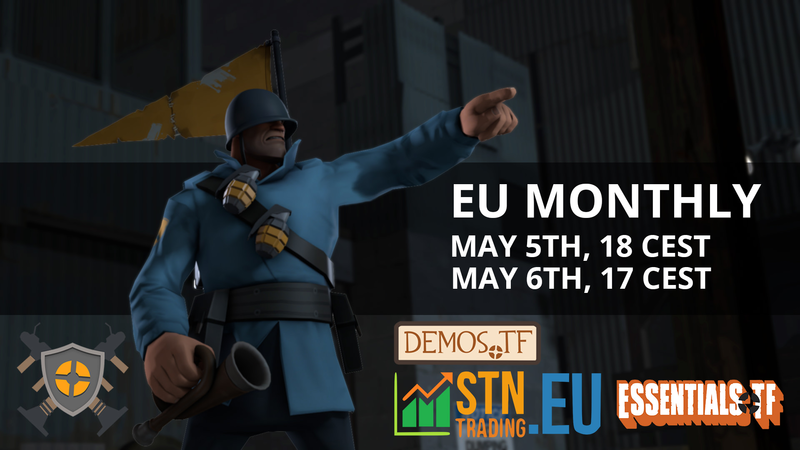 STN Trading and Demos.tf continue to sponsor the EU edition. The rules are the same as the Monthly before, but there are a few changes in this month’s whitelist. Check the post below for further details! The rules for the tournament will be the same and will be slightly different from the norm in a bid to bring us to a place that can be easily picked up by new players and spectators along with moving to the goal of opening up the whitelist by having the totally broken weapons fixed. This month, several items have been added to the whitelist. These items include: the Fists of Steel, Atomizer, Beggar’s Bazooka, and the Sydney Sleeper. If you would like to give any feedback or just say hello then join the Essentials.TF Discord or on Twitter. ok not to be rude, but if one of the goals is “to bring us to a place that can be easily picked up by new players and spectators” how exactly is adding as many weapons as possible to the whitelist going to help make the game more accessible, especially for spectators? because the narrative of blindly allowing things so valve cares a grand total of 1% more about comp has brought us great stuff in the past, like turbine in mm! 5CP maps only? koth is especially suitable for cups… why would you force 5cp? do players really prefer it over koth?